Jeep® Cherokee dives into muddy waters with zeal, DriveChicago.com, June 8 By Dave Boe. Elkhart Lake Wisconsin- While five-door crossovers of all sizes have emerged as a trendy, popular segment among pavement dwellers, those seeking less-traveled, slightly spirited terrain still have a go-to option; Jeep. This iconic, go-anywhere brand celebrates its 75th anniversary in 2016. 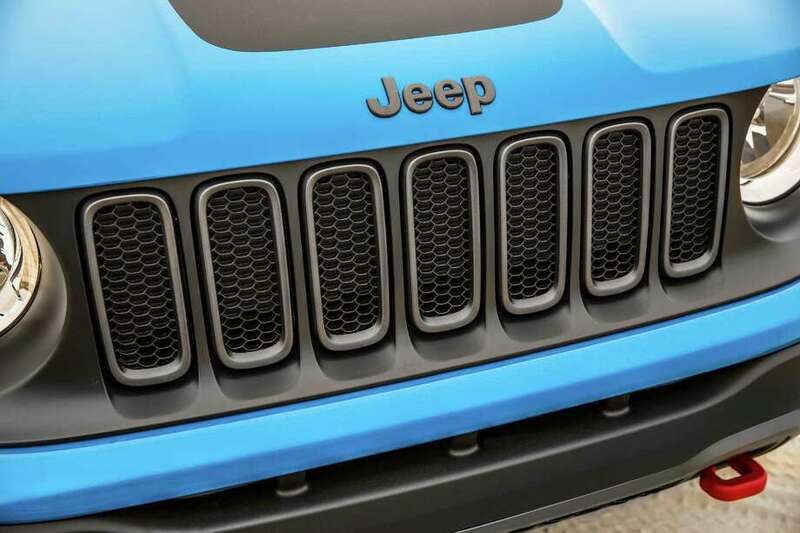 Now a cog of Fiat Chrysler Automobiles (FCA), Jeep sales now inhabit a growing number of markets worldwide. The five-door Cherokee crossover was re-introduced to Jeep’s lineup in the 2014 model year, dissing body-on-frame truck underpinnings in favor of an ultra-sturdy, uni-body, car-like design. First introduced in 1984 with three or five door body styles, Cherokee’s first retirement came about in 2001 before roaring back three years ago. Those yearning for off-road adventures via a mid-size crossover deserve quality, behind-the-wheel time with Cherokee’s 2016 Trailhawk trim, our tester this week with standard four-wheel drive teamed with an off-road kit adding an additional inch of ground clearance, skid plates and locking rear differential. Expect a pair of red tow hooks under the front fender and one rear bound under the driver’s side rear fender. Cherokee provided plenty of on and off-line chatter with its 2014 return sporting a more fluid, less sculpted exterior most noticeable up front. The iconic, bold seven-slat grille underwent a Jenny Craig type of transformation, boasting sleek contours rather than a flat-faced approach. In effect, Cherokee underwent a stylish nose job. Headlights flanking the nuanced seven-slat grille also shed familiar, circular, eyes-wide-open status, opting for a relaxed, casual, almost-closed appearance reminiscent of a contented house cat. Tail lights adopt a narrow horizontal tune, snuggling under narrow hatchback glass featuring a standard wiper and spoiler-like top trim home to the brake light. While some Jeep purists may balk at this heritage tinkering, take rates point to a different reality. Cherokee sales increased a healthy 23 percent in 2015 compared with the 2014 calendar year. At 184 inches of overall length, Cherokee measures in at the shorter end of the mid-size spectrum. Cherokee offers a segment best three (3) four-wheel-drive systems depending upon a customer’s off-road intentions (Active Drive I, Active Drive II and Active Drive Lock). Trailhawk is the sole trim with Active Drive Lock featuring a low range selection and locking rear differentials. All Cherokee 4 x 4s include an electronic ‘Selec-Terrain’ featuring five customizable settings (auto, rock, snow sand/mud and sport). A twist dial left of the floor-mounted transmission shifter allows selection. The dial’s four-quadrant top includes operation of hill decent control, low-gear selection and rear locking. Downstream of the shifter, side-by-side beverage holders reside in front of a large, multi-level storage bin. Upstream, plug-in-ports nested inside a cove await portable electronic devices. Off-road prowess got put to the test in late May at the annual Midwest Automotive Media Association (MAMA) Spring Rally at historic Road America. The Wisconsin track may be well known for high-speed hair-pin turns and elevation changes, but nested on property is a professionally-groomed off-road encounter where Jeeps and other rugged toys come to play within a slower-speed environment. The Chicago-based Midwest Automobile Media Association also celebrates a milestone birthday in 2016, reaching a young adult 25. Morning showers provided a fresh coat of muddy top soil for Trail hawk and pickup trucks from General Motors, Toyota and Ford along with assorted, pricier Land Rover family members. The uni-body Trail hawk performed admirably through rocky terrain, deep mud, wayward ditches and sloppy hair-pin corners, never dissuaded from reaching the finish line. When done frolicking in the mud, an electronic parking brake tab resides directly aft of the transmission shifter. Of all the dozen or so muddy buddies traversing the off-road course during AM hours, Cherokee Trail hawk came to play with one of the lowest price tags accompanied by on-road handling comforts lacking in most pickups. Also assisting the cause; Trail hawk’s extra ground clearance and an approach angle of 29.8 degrees. Two available engines in all Cherokee trims include a standard 2.4-liter four cylinder cranking out 184 horses. Opt for the 3.2-liter Pentastar V-6 and enjoy 271 horses. Both engines utilize regular, 87-octane fuel and team with a very modern, segment exclusive nine-speed automatic transmission. The gas tank holds 15.9 gallons of regular, 87-octane fuel. Updates in 2016 remain minimal. When opting for the larger (and recommended) “Uconnect’ 8.4-inch multi-function in-dash screen, expect more hands-free and voice-activated opportunities. In addition, a new, luxury-appointed ‘Overland’ trim is now available joining Sport, Latitude, Limited and our off-road intended Trailhawk tester. In 2015, Cherokee introduced Engine Stop-Start technology enabling better fuel economy. Standard on our V-6 test model, the engine shuts down upon coming to a complete stop, restarting automatically when summoning the accelerator pedal. Starting price for our Trailhawk 4 x 4: $30,995. Option packaging included $1,745 for the upgraded V-6 with start/stop technology, $1,045 for safety tech group (rear park assist, cross path detection), $945 for in-screen navigation package with five years of Sirius XM traffic subscription and $1,695 for the comfort group (power lift gate, dual zone climate control). The bottom line ended at $37,420 including a $995 destination charge. A 2016 front-drive (4 x 2) Sport trim checks in at $23,495. Jeep continues as versatile inside as out with a shotgun front bucket seat back able to fold flat onto the comfy cushion, creating numerous cargo-carrying options. When prone, the seat cushion flips forward, revealing a hidden storage cove. Second row 60/40 split seats move fore and aft increasing comfort and cargo area storage flexibility. The optional power hatchback closes via left-panel push button, a convenient location when compared to the door’s underside frame, a locale popular with many SUVs. Electronic push-button start comes standard. The center dashboard’s top region includes a wide, shallow, covered storage region ideal for I Pass transponders or other small items. Trail hawk features a black interior with contrasting red stitching with leather and cloth seating materials. As with most FCA products, the user friendly ‘Uconnect’ audio system incorporates large screen icons teamed with ‘words,’ easing confusion and mis-identification. Large and welcome tactile dials handle primary ventilation fan speed duties, audio volume and station selections. Uconnect’s center piece 8.4-inch in-dash multi-function touch screen welcomes cell phone connections and ‘app’ downloads. Creative tactile engineering allows finger tips to adjust audio and station presets from long, toggle-like switches located on the backside of the steering wheel, a natural resting position for fingers. The three-spoke steering wheel’s front includes large cruise control options at 3 o’clock and instrument panel window display selections at 9 o’clock. Compared with other mid-sized crossovers, Cherokee welcomes rough terrain, especially the off-road intended Trail hawk capable of towing an impressive 4,500 pounds with the optional V-6 engine. When on-road, handling characteristics rate superior to most truck-like sport utility vehicles.